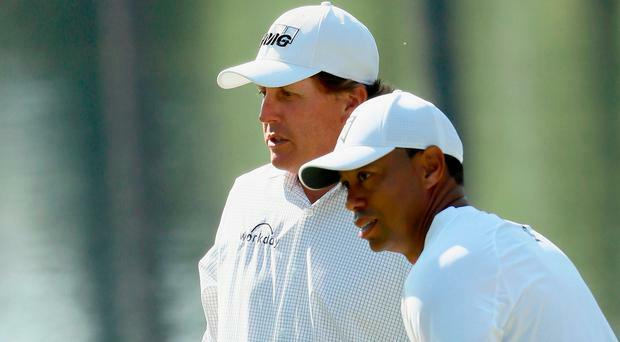 It will not banish the memories of their ill-fated Ryder Cup partnership, but Tiger Woods and Phil Mickelson were finally able to enjoy a victory together yesterday. Fourteen years after losing twice on the opening day at Oakland Hills after being paired by US captain Hal Sutton, the long-time rivals teamed up to beat Fred Couples and Thomas Pieters in a nine-hole practice round ahead of the Masters. "They enjoyed beating us badly, I will say that," Couples said. "I feel bad for Thomas because I couldn't have helped Jack Nicklaus in his prime today. Thomas had a lot on his shoulders." Starting on the back nine, Couples and Pieters won the first two holes but then saw Woods eagle both the 13th and 15th and Mickelson make five straight birdies. "I think come Sunday, they might be paired together," Couples added. "They're playing extremely well. They love the course. And they're going to do very, very well." Mickelson, 47, who won for the first time since 2013 last month, is aiming to surpass Jack Nicklaus as the oldest ever winner at Augusta National. And Woods, who underwent spinal fusion surgery last April, is seeking a first major title - and 15th in total - since winning the US Open in 2008. Asked about the improved relationship between himself and Mickelson, Woods said: "Our friendship has gotten stronger. We have competed a lot of times. Hopefully we'll have a few more."